Our new stove's rating in the manual is 113,000 BTU (even though if I add up all of the burners and burners it is only 96,000). As I went to go buy a new flex gas line I noticed that the 5/8" OD line at 48" long is only rated for 106,000 BTU/hr. Would this be a problem to just use this size and length line? 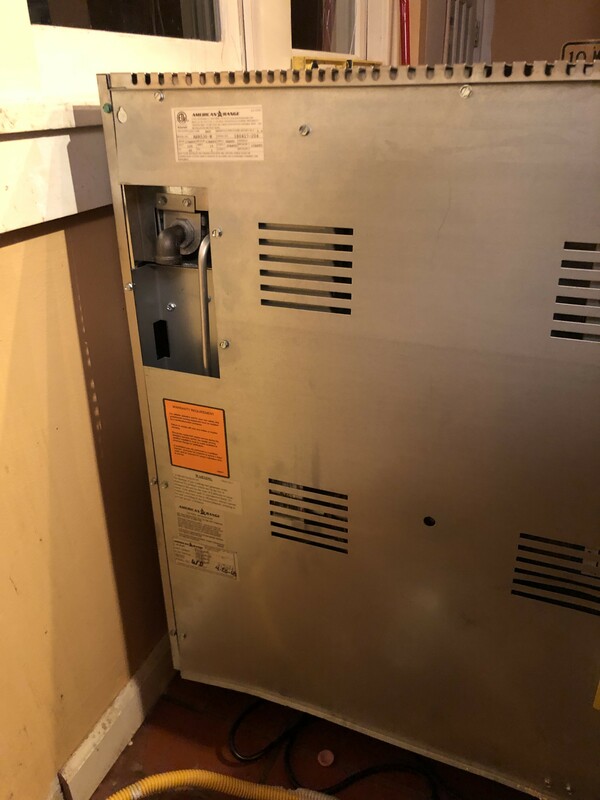 The gas inlet for the range is 30" off of the floor, and the gas valve from the house supply is a few inches off of the floor. So with a 48" line, I would have at most about 16" to pull the stove out from the wall to access the shutoff valve. Disconnecting the flex line likely wouldn't be too hard since the access door is up at the top, but I would have to climb onto the counter to get at it. The previous stove had it's gas inlet on the bottom under the oven, so this is pretty different for me. 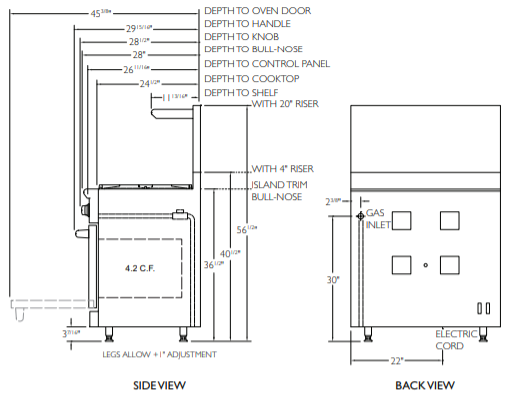 I have no problem calling a plumber if I *have to* but would like to be able to get this done myself as it is the weekend and my wife would like to have a stove. What do people think about the BTU rating of the flex line and only being able to pull the stove out 16" or so? You need longer and higher BTU rated flex line. The gas inlet for the range is a 90 degree street valve. Can/should I run a black pipe down behind the shroud and present a fitting at the bottom of the back cover? Seems like that would help with any length issues but it wouldn't be secured to the appliance, as I don't see a way to do that. Is this intended to be a flex line all the way up to that street valve? What 16345ed said will be way easier and cheaper . Thank you again for replying, I really appreciate the help! So then my target is a 1" OD flex line at 72" length, which looks like it should be rated for at least 172,000 BTU/hr. Also, do plumbing supply shops usually carry these? Or would an appliance parts place be the place to look for this? Thank you! It is a natural gas line to the range. I did quite the tour of home depots and Menard's (I am in Minneapolis, MN) yesterday with no luck. They only had ones up to 5/8" OD, and nothing longer than 48". I can see that home depot has what I am looking for on their website to order, but I was hoping to get one tomorrow so we could be back up and running a little sooner than the week it takes to get Home Depot to deliver that part. Also, with that flex line, it seems like I would need a 3/4" flare fitting to 1/2" MID to join into the input on the range. Home depot didn't have that in store and it doesn't look like it comes with the flex line on their site. I have to assume that is a more common fitting for a plumbing supply shop, Menard's had very limited 3/4" brass fittings. I will head out to Lowe's and see if they have what I need. Your welcome, glad you don’t have to fool with converting it . A line for a gas water heater may also be a option ! As a final follow-up, I had my regular plumber come out and inspect the total run of the gas supply line, and give advice on the installation of the range. He said that the inspectors here in Minneapolis do in fact require that the shutoff be behind the range, not in a cabinet. Also, my 5/8" OD, 1/2" ID gas supply line is rated well enough (over 100,000 BTU) for my stove and would work fine. I ended up hooking it up myself with a 1/2" ID flex line and everything is hunky-dory. Thanks to everyone for the advice!